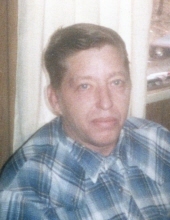 George P. Swearengin, age 77, of Pine Top, KY, passed away Friday, January 25, 2019, at the Knott Co. Health and Rehabilitation Center in Hindman, KY. He was born at May, KY on September 4, 1941 to James P. Swearengin and Lavinia Hale Swearengin. Funeral services for George P. Swearengin will be held at the Hindman Funeral Services Chapel, Monday, January 28, 2019 at 1:00PM with Jared Salmons and Dylan Combs officiating. Burial will follow at the Honeycutt Cemetery at Pinetop, KY. Friends may call for visitation at the Chapel, Sunday evening after 6PM with additional services at 7PM. with Jared Salmons and Dylan Combs officiating. "Email Address" would like to share the life celebration of George P. Swearengin. Click on the "link" to go to share a favorite memory or leave a condolence message for the family.